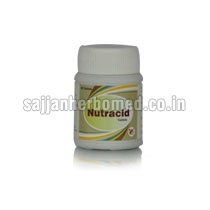 Nutracid Tablets that we offer are used for gastric and hyperacidity disorders and are also helpful in relieving heart burn and protecting gastric mucosa. Our Nutracid Tablets are extremely safe and prepared using herbal ingredients like Shankha bhasma, Praval pisti, Muktashukti bhasma and others. We offer these Nutracid Tablets in safe packaging in order to protect them from any external contamination. Amalaki (Emblica officinalis) extract q.s.